The RB26DETT is a very popular Nissan engine that can produce over 500 horsepower when modified with aftermarket parts and upgrades. 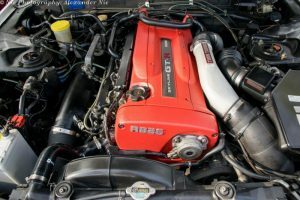 It is a 2.6L inline-6 cylinder engine that was built for the Nissan Skyline GT-R.
What makes the RB26DETT engine such a powerhouse is the fact that it is equipped with twin Garrett T28-type ceramic turbochargers. These turbos produce up to 10 psi of boost which helps it generate 276 horsepower from a stock 2.6L engine. Another unique feature of this engine is that it has 6 individual throttle bodies instead of one. Very few engines come from the factory equipped with this feature due to the additional cost, however this throttle body design has several advantages. First, individual throttle bodies create almost instant throttle response. Meaning when you step on the gas, you’re gone. Second, this design allows for increased efficiency allowing you to make the most of the boost coming from the twin turbochargers. Why is the RB26DETT so popular? From 1989 until 2002, Nissan produced the RB26DETT engine for use in the Nissan Skyline GT-R. This car was quickly nicknamed “Godzilla,” thanks in part to the enormous horsepower potential under the hood. All of the RB series engines, including the RB26DETT, were manufactured in Yokohama, Japan. The engine factory is located within the Kanagawa-ku ward in the city of Yokohama and is Nissan’s oldest manufacturing plant. Although the Skyline GT-R was only produced and sold in Japan, it has become extremely popular in the United States. Now that the 25 year import rule is in effect for the early Skyline GT-R models, collectors and race shops finally have a chance to get their hands on one. Another reason the Skyline GT-R is so popular is because it made multiple appearances in the Fast and Furious movie franchise. Most notably, a 1999 Skyline R34 GT-R was driven by Brian O’Conor (played by Paul Walker) in the movie 2 Fast 2 Furious. The Skyline GT-R engine is every tuners dream. It offers excellent stock horsepower, but is durable enough to take on almost any aftermarket upgrades you’re willing to throw at it. The name of the engine, RB26DETT, might seem random but it is actually a code developed by Nissan to describe the features. What does RB26DETT stand for? Off the showroom floor the Skyline GT-R had 276 horsepower at 6800 rpm and 293 lb-ft of torque at 4400 rpm. With a few upgrades this engine has been known to produce anywhere from 500 to 1000 horsepower. As denoted by the “26” in the name of the engine, it has a displacement of 2.6L or 156.7 cubic inches. The stock bore is 86.0 mm (3.386 inches) and stroke is 73.7 mm (2.902 inches). As we mentioned earlier, this engine is very durable and was built for performance. The block is cast iron and provides a sturdy foundation for your future upgrades. On the other hand the cylinder head is constructed out of aluminum which offers an opportunity for additional porting. The valvetrain features dual overhead camshafts with a total of 24 valves. Each cylinder has 4 valves which help quickly deliver the boost from the twin turbochargers. In addition, the intake is equipped with 6 individual throttle bodies instead of one. These attach to a log style intake manifold to improve efficiency and performance. Like Godzilla itself, the RB26DETT engine has become somewhat of a legend in the United States. The Nissan Skyline GT-R, which used this engine, was only produced and sold in Japan. 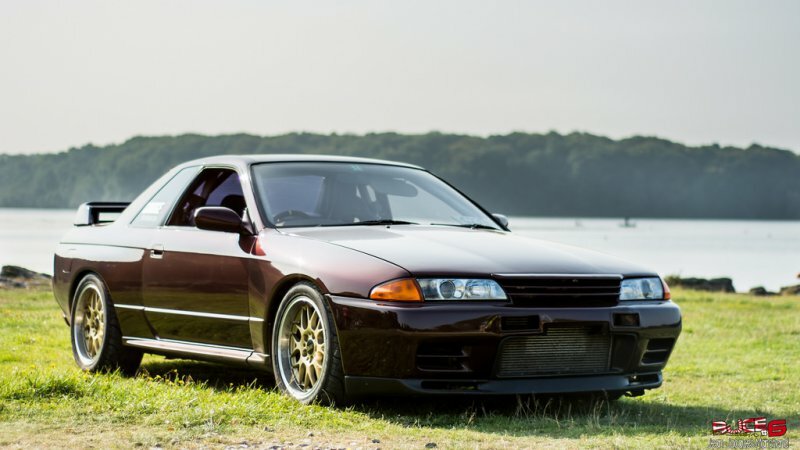 However, until recently it was illegal to import this car into the U.S. Due to the 25 year import law expiring on the early Skyline GT-R models, you may start seeing more of them on the roads. With twin Garrett T28-type ceramic turbochargers and 6 individual throttle bodies, this Nissan engine is a unique beast. It is unlikely that we will see anything like it roll off of the factory floor ever again due to stricter emissions standards and fuel economy concerns.